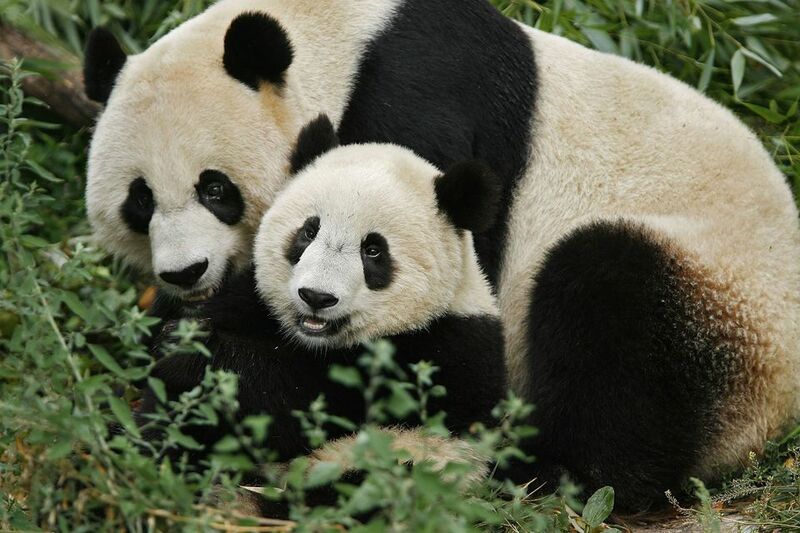 Giant Pandas are an endangered species. The National Zoo is a recognized leader in the care and study of the Giant Panda and has worked for decades to conserve them. About 1,600 Giant Pandas exist in the wild and nearly 300 live in zoos and research facilities in China and around the world. Pandas Tian Tian and Mei Xiang arrived in Washington DC on December 2000 under a 10-year, $10 million loan agreement with China. The contract for the Giant Pandas was renewed and the National Zoo will keep them until 2020. Under the breeding agreement with the China Wildlife Conservation Association (CWCA), all panda cubs born at the Zoo will return to China by the time they turn four years old. Panda Cub Update: Bao Bao moves to China on February 21, 2017. Mei Xiang has given birth to three surviving cubs. Tai Shan, a male cub was born on July 9, 2005. He was returned to China on February 4, 2010 to enter the breeding program at Wolong's Bifengxia Panda Base in Ya'an, Sichuan. Giant panda cubs born at the National Zoo belong to China and are to enter the breeding program contributing to species conservation sometime after the cub turns two. The Zoo successfully negotiated two extensions with the China Wildlife Conservation Association, which allowed the Zoo to keep Tai Shan for two-and-a-half years beyond the original contract. Mei Xiang gave birth to Bao Bao, a second panda cub, a female, on August 23, 2013. When the cub is 4 years old she will move permanently to the China Conservation and Research Center for the Giant Panda in Wolong where she will enter into the breeding program. On August 22, 2015, Mei Xiang gave birth to a male cub, Bei Bei which means "precious, treasure" in Mandarin Chinese. In celebration of the state visit in September 2015 and as a special honor for the cub, the name was selected by First Lady of the United States, Michelle Obama, and First Lady of the People's Republic of China, Peng Liyuan. Bei Bei is healthy and doing well. At the National Zoo, the pandas live at the Fujifilm Giant Panda Habitat, a state-of-the-art indoor and outdoor exhibit designed to mimic the pandas' natural habitat of rocky, lush terrain in China. The habitat opened as part of the National Zoo's Asia Trail on October 17, 2006 adding more than 12,000 square feet to the Pandas' outdoor exhibit and additions to the indoor exhibit providing more visitor viewing space and informational exhibits. The outdoor exhibit was designed to recreate the Pandas' natural habitat including rock and tree structures for climbing; grottoes, pools, and streams for keeping cool; and shrubs and trees, including weeping willows, corktrees, maples, and several species of bamboo. Visitors can view the Pandas from two levels and can get much closer to them than ever before. The Giant Panda Experience Zone enables visitors to get up close to examine the pandas, with only a glass barrier between them. At the Plaza's Decision Stations, you can learn more about efforts to save pandas, see a topographic map of the mountains of central China, and experience multimedia displays of photos, video, and audio exploring the life of the Giant Pandas. National Crime Museum in Washington, DC is Closing!